» You're Invited...Come See Us at NAB! 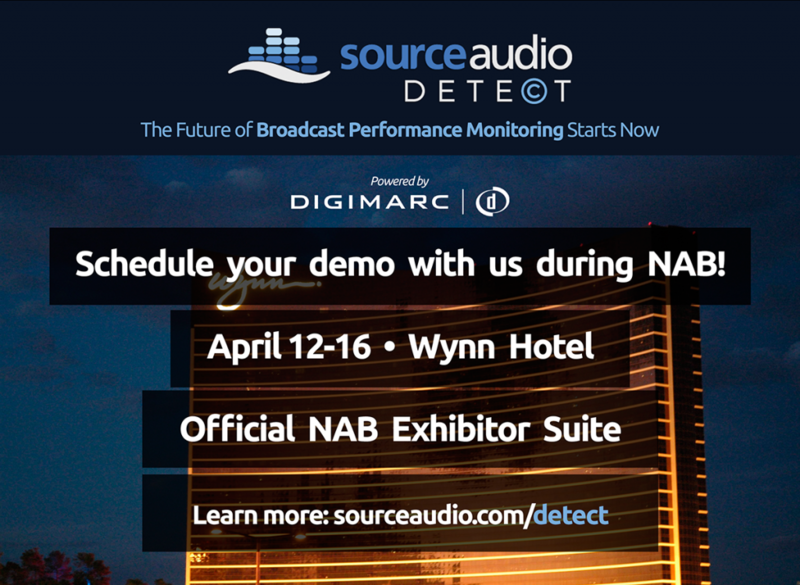 Come see us in our official NAB Exhibitor Suite at the Wynn where we'll be giving demos of our newest product that will soon change broadcast monitoring as we know it: SourceAudio Detect. With SourceAudio's massive music hosting & distribution platform plus Digimarc's proprietary and industry-leading watermarking & encoding technology, we are months away from launching our new monitoring network that will provide you with accurate, instant broadcast performance reporting on programs, commercials, promos, and trailers. » How Does SourceAudio Detect Work? » Learn More Below & We'll See You at The Wynn! Visit our newly updated website to learn more about what SourceAudio Detect can do for you. Follow the link below to schedule a demo with one of our team members and apply to be part of our free 6 month beta period!